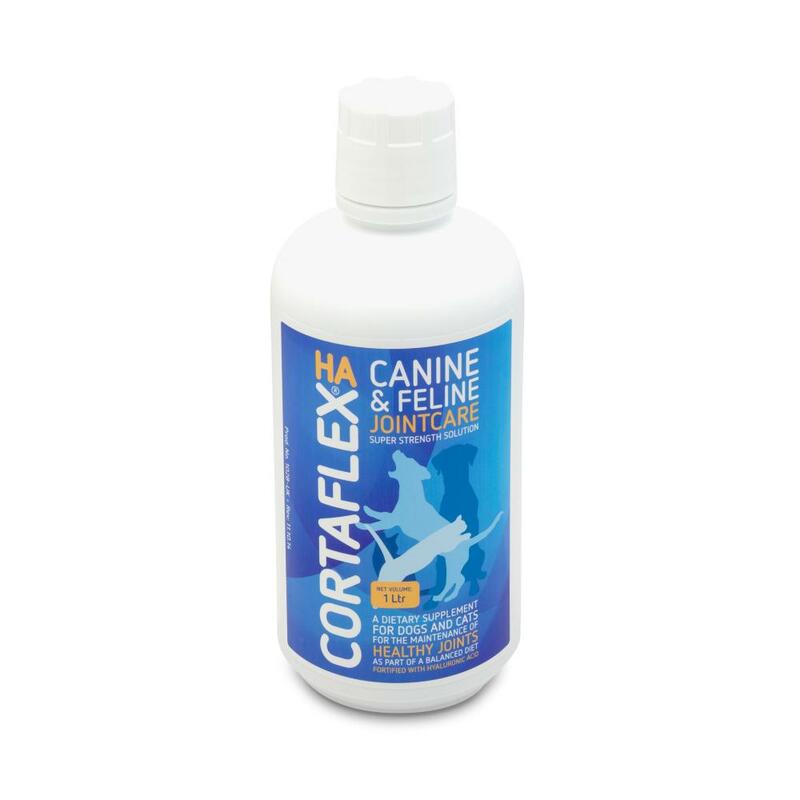 Cortaflex Mobility Supplement is a unique, fast-acting blend of safe, natural ingredients which are associated with encouraging normal joint function. 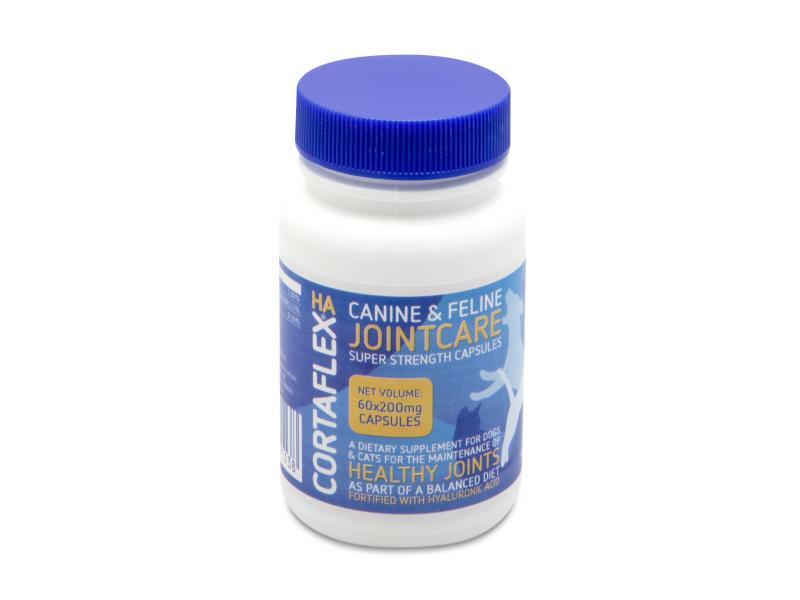 Cortaflex, based on a formula which has had success in aiding joint movement, is particularly useful in older animals who are experiencing joint stiffness and discomfort as it may ease stiffness. Water, Dextrose, Soy Protein Hydroslate, Mucopolysaccharides, Hyaluronic Acid, Glycine, L-Glutamine, Glucuronic Acid, L-Proline, Glutamic Acid, L-Alanine, L-Arginine, L-Serine, L-Valine, L-Histidine, L-Tyrosine, L-Isoleucine, Aspartic Acid, Manganese Sulphate, Pyridoxine HCI, Ascorbic Acid, Sulphur, Xanthan Gum, Ammonium Propionate as a preservative. Feed daily with regular meal. For the initial period of 7 days feed double amounts. Mucopolysaccharides , Soy Protein Hydrolysate, HyaluronicAcid, Glycine, L-Glutamine, Glucuronic Acid, Glutamic Acid,L-Proline, Aspartic Acid, Sulphur and Cellulose Capsules. 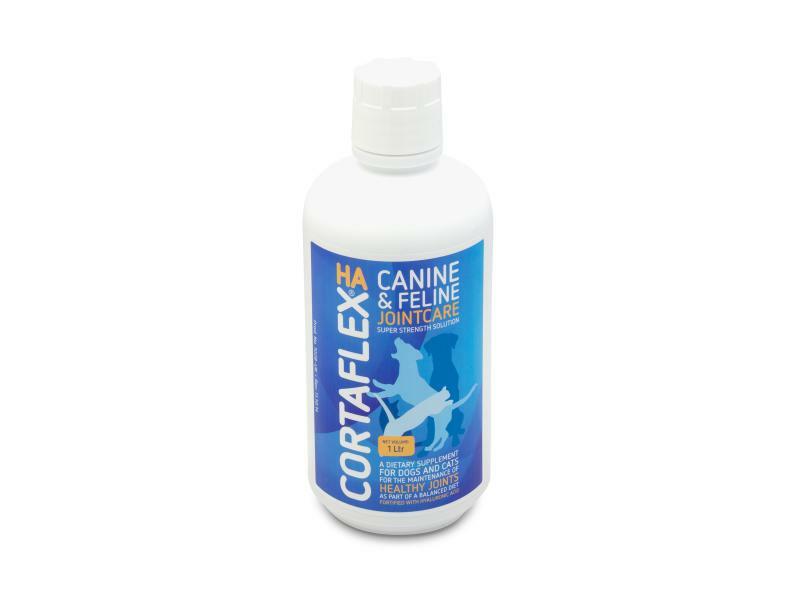 Below are some recent questions we've received regarding Cortaflex Mobility Supplement for Dogs & Cats, including answers from our team. 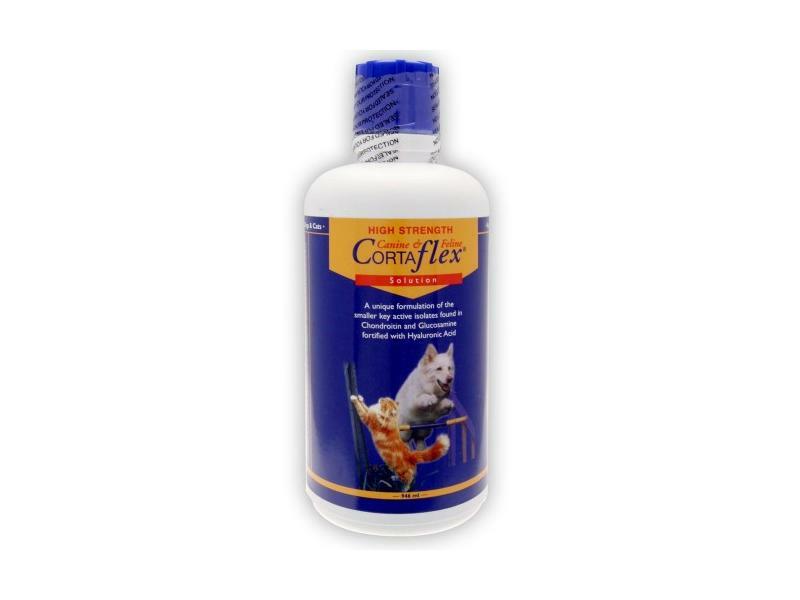 Cortaflex is suitable for your cat and is intended to help support the joints as they suffer from the effects of wear and tear. It might well help the joints of the front legs and indeed most of the other joints in the body. Your cat's gait will of course change now and that might well put abnormal strains on most of the joints. I would say however that many cats in the sort of situation as your cat live very normal and active lives and do not suffer badly at all. A joint supplement should help though. Is this an anti inflammatory? I'd like something which works in the same way as metacam, but doesn't have the side effects. The side effects come from the way Metacam works. Generally the more powerful the anti-inflammatory and pain-relieving effects, the greater the risk of serious side effects. Metacam is actually pretty good when used in otherwise healthy patients. Most of the bad reactions come from using it in ill or dehydrated dogs. If there was something which worked as well as Metacam but did not have any risks of side effects, nobody would use anything else. Sadly there is no such thing. There are lots of very safe products which can be used instead, but none of them is likely to work as well as Metacam. Cortaflex is one such product and it is fine to use it and see how things go. You may well be able to reduce the dose of Metacam in future, which dramatically reduces the risks of side effects. You should of course talk to your vet about that first. This is the same as the standard liquid. It just means that twice as much of the active ingredients are given. The product is very safe and unless your pet has some other health problems, it should be safe to give. If in doubt, ask your own vet about it. will this take my dogs pain away and is it safe to give to dogs with kidney problems ( vet strength ). This supplement is safe to give and would not be expected to cause any trouble for a dog with kidney pproblems. It may well reduce the pain from sore/stiff joints in time, but it takes a few weeks to be fully effective. It is unlikely to be as potent as prescription non-steroidal drugs, but it is a lot safer. If you can afford a supplement like this, it is well worth trying. Some dogs do improve a lot, though in some cases it seems to make little difference.